A few months ago while I was hosting Andie Alexander for a week or so in Thessaloniki, Greece, I decided that among our daytrips should be a visit to Mt Olympus (a destination that is, I know, among the highlights of anyone who visits Greece—that and the Parthenon in Athens, of course). So one day we took the highway south, towards Athens, and about 2 hours drive from Thessaloniki we reached the slopes of the mountain, which myth has it was the home of the “Twelve Gods” of the ancient Greeks. Over bumpy roads and narrow passages that made for a thrilling experience, we drove up the mountain to a refuge (a youth hostel with coffee service), which was at 1000 metres height above sea level and about 2000 metres below the top of the mountain, surrounded by thick vegetation and a wonderful view of the Aegean Sea and the Gulf of Thessaloniki. We ordered our frappes and soon we found ourselves in the middle of a conversation with the owner of the shelter and a couple, who, like us, came to spend the day in this idyllic surrounding. A conversation about how the economic crisis has affected his business (a common theme in Greece these days like talking about the weather in Edmonton where I’m doing my PhD), and as one question led to the other, we learned that the people who mostly visit at least his shelter (apart from Greeks that is), are Russians and Germans. 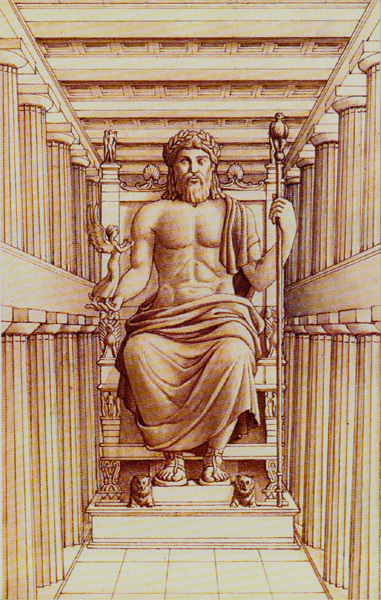 And before we knew it he told us, with an ironic smile, that most of them are searching for the actual throne of Zeus. We all, of course, burst out laughing. That the author of the post is so certain about the kind of gardening techniques actually used 2000 years ago and which are obviously in use today made me think about that tourists’ quest of the throne of Zeus. That we search for chimaeras, and that sometimes we think we have found them is apparently not news and that all sorts of funding is also available, say, for searching for everything from the “religious gene” to the meaning of texts and their contexts that are thousands of years old and covered with multiple contexts and narratives about them, and even to lost Atlantis is not news either; but what is of interest here, I think, is that these quests for origins don’t make us burst into laughter (quite the contrary actually, for serious money supports such quests) as easily as, say, searching for the throne of Zeus, and this is something that I personally find very curious.